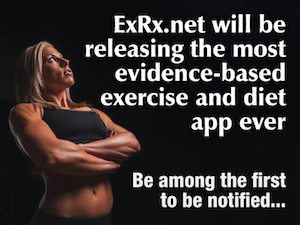 ExRx.net is a resource for exercise and fitness enthusiasts featuring comprehensive exercise libraries, fitness calculators, and reference articles. Topics include exercise instruction, weight training, aerobic conditioning, weight management, diet and nutrition, psychology, kinesiology, ergogenic aids, fitness testing, sports conditioning, and beginning exercise. Paid ads conform to Google paid link policy. Sorry, we do not sell text links. Please don't ask. We also rarely respond to reciprocal link requests since we are inundated with requests regularly.